Cameras » Compact Cameras » WG Series » RICOH WG-60 » RICOH WG-60 announced! RICOH COMPANY, LTD and RICOH IMAGING COMPANY, LTD. announced the launch of the RICOH WG-60 digital compact camera. This new model features a compact, lightweight body design, with exceptional waterproof and shockproof performance. This standard-class waterproof digital compact camera is designed so that anyone can capture outdoor activities more casually, effortlessly and without worries. 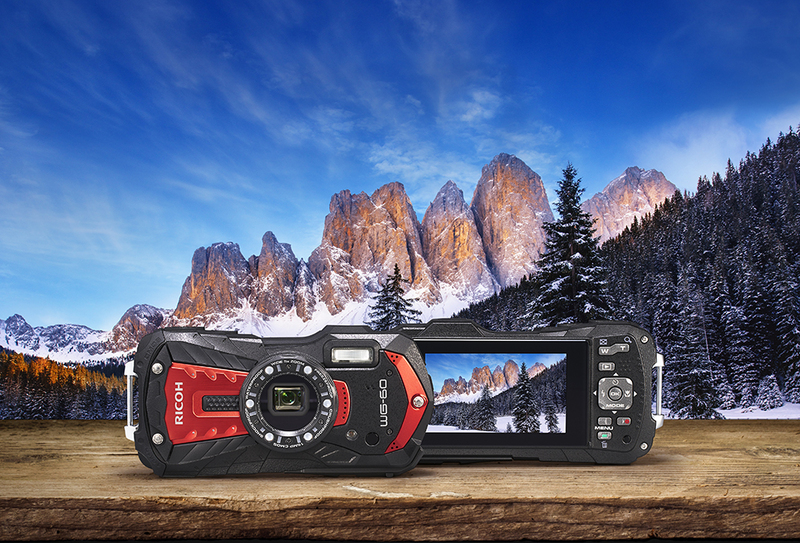 Despite its compact, lightweight body, the WG-60 offers outstanding basic specifications that outperform ordinary digital cameras and smartphones under demanding outdoor conditions. It is waterproof to a depth of 14meters; shockproof against a fall from a height of 1.6 meters; and freeze-proof against temperatures as low as -10°C. It also comes equipped with an outdoor-friendly LCD monitor whose brightness level can be instantly adjusted to the lighting level of a shooting situation. The solid, airtight body common to the WG-60 is not only waterproof down to a depth of 14 meters for up to two hours of continuous operation (equivalent to IPX 8 or JIS Class 8), but is also shockproof against falls from a height of 1.6 meters,* dustproof (equivalent to IPX 6 or JIS Class 6), freeze-proof to temperatures as low as -10°C, and crushproof against weights up to 100kgf (kilogram force). ** Thanks to this heavy-duty construction, the cameras perform superbly and dependably even in harsh, demanding outdoor conditions. * Measured under RICOH IMAGING-original testing standards — from a height of 1.6 meters, onto a surface of 5cm-thick plywood — conforming to Method 516.5-Shock of the MIL-Standard 810F. The WG-60 come equipped with a back-illuminated CMOS image sensor, which assures excellent high-sensitivity and low-noise characteristics and high-speed readout of image data signals. Coupled with a high-performance imaging engine, this image sensor delivers a top sensitivity of ISO 6400 and super-high-resolution images with approximately 16.0 effective megapixels. These models also provide advanced image processing functions, made possible by the latest super-resolution technology, to assure sharp, clear, high-resolution images. They even offer such innovative features as Handheld Night Snap mode, which automatically captures several images of the same nighttime scene and produces a single, blur-free composite image from them. The WG-60 feature a high-performance, five-times optical zoom lens with a focal-length coverage from 5mm to 25mm (equivalent to approx. 28mm to 140mm in the 35mm format) to accommodate a wide range of scenes and subjects, including sweeping landscapes. They also provide other convenient shooting functions, such as a macro mode to capture dramatic close-up images from a minimum focusing distance of a mere one centimeter; an Intelligent Zoom function to extend the zoom range to approximately 36 times (equivalent to 1008mm in the 35mm format) without compromising image quality, for superior telephoto photography; and an interval shooting mode, which comes in handy for fixed-point observation. Ideally positioned around the circumference of the lens barrel for macro shooting, six LED Macro Lights allow the WG-60 to provide bright, uniform illumination on a subject when the Digital Microscope mode is selected. *** Thanks to these Macro Lights, the user can clearly see a magnified view of the microscopic world undetectable by the naked eye on the camera’s LCD monitor, and effortlessly capture eye-catching, close-up images. In order to minimize camera shake and subject shake, the Instant Illumination Enhance function allows for the use of a higher shutter speed by automatically raising the discharge level of the Macro Lights at the moment of shutter release. The Macro Lights also provide other useful functions, such as a Self-Portrait Assist mode, which uses the blink of an LED lamp to check if the subject’s face has been safely captured within the picture frame, and the LED Lighting mode, which uses the Macro Lights as a lighting device in the dark. Specifically designed for underwater photography, the Underwater and Underwater Movie shooting modes are programmed to optimize color and contrast, based on the data of images actually captured under the water. These modes deliver sharp, true-to-life images by enhancing shades of red which are lost in underwater photography, while effectively compensating for the loss of contrast caused by the diffusion of light in water. During Underwater mode, the Flash Off + Flash On option, allows the user to consecutively capture two images — with a single shutter release — one without flash and another with flash. The WG-60 provide Full HD movie recording employing the H.264 recording format. Users can capture high-quality, extended movie clips (1920 x 1080 pixels, 16:9 proportions) at a frame rate of 30 frames per second. To add some creative touches to movie recording, they also feature a high-speed camera function**** for slow-motion playback of captured movie clips, and an interval movie function. A micro-HDMI terminal (Type D) is also provided on the camera body for simultaneous output of Full HD movie clips and sound to external audio-visual devices. When the camera detects low-lighting conditions in still-image shooting, this mode automatically raises the sensitivity up to as high as ISO 6400, making it possible to use a higher shutter speed and effectively minimize the adverse effect of camera shake and subject shake when dealing with poor lighting conditions. Posted in Announcements, Cameras, Compact Cameras, News, RICOH WG-60, WG Series.